Car, bus, train, or tram. Easy. Whatever your mode of transport, getting to the Caravan, Camping & Touring Supershow is easier than ever. We've moved the parking area closer to the gates to make it as effortless as possible. We're also walking distance from tram, train and bus stops. Melbourne Showgrounds is a fully accessible venue with access ramps to all pavilions and buildings. 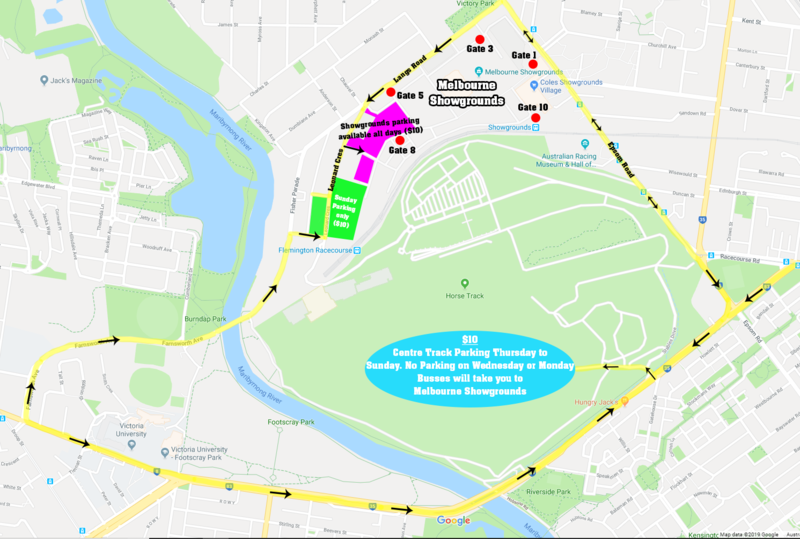 Dedicated parking spaces are available at Melbourne Showgrounds through Gate 5 off Langs Road for $10. An accessible shuttle bus will be in service, running between the Carparks and Melbourne Showgrounds. For more information about internal access please click here. Melbourne Showgrounds is easily accessible via bus, tram and train services. Bus: Bus No 472 (Williamstown to Moonee Ponds) stops along Langs Road and Epsom Road. Bus No 404 (Footscray to Moonee Ponds) stops on the corner of Epsom and Ascot Vale Road. Tram: Route 57 from Elizabeth St/Flinders Street (Stop 1) to Melbourne Showgrounds / Epsom Road (Stop 33). Passenger are advised to alight from Stop 32 (Epsom Road / Sandown Road – opposite Coles Supermarket) and walk approximately 200 meters to Showgrounds entrance. Train: Melbourne Showgrounds has its own train station. Trains will be running from Southern Cross Station and Flinders Street station. This year trains will be running on Friday, Saturday & Sunday. Friday trains run from 9:15am until 3:30pm then 6:30pm until 8:30pm. Saturday trains run from 9:15am until 10:05pm. Sunday trains run from from 9:15am until 5:15pm.